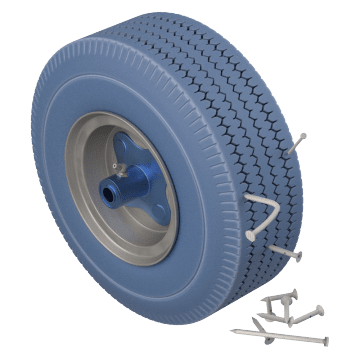 These cushioned tires provide shock-absorbing performance, which is ideal for both sensitive applications such as lab carts and rough terrain such as landscaping equipment. These lightweight wheels have air-filled tires for a quiet, cushioned ride. Pneumatic casters are more economical than semi-pneumatic and flat free, but are susceptible to punctures and require more maintenance. They are a good choice for areas where sharp debris isn't present. Use centered hubs on casters and offset hubs with fixed axles on hand trucks, wheelbarrows, lawn mowers, and other outdoor equipment. 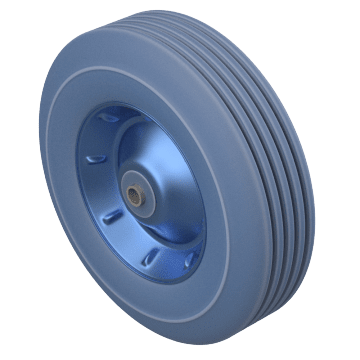 The non-pressurized void (air pocket) in the center of these wheels reduces their weight and cost while their rubber tread helps prevent them from going flat if punctured. 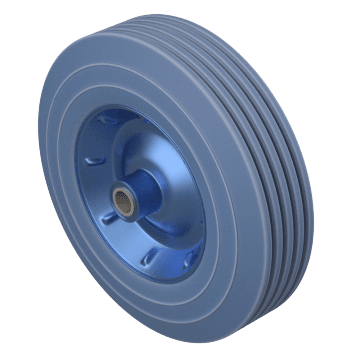 They are more rigid and have less cushioning than pneumatic or solid flat-free wheels, making them a good choice for areas with smooth, flat surfaces. 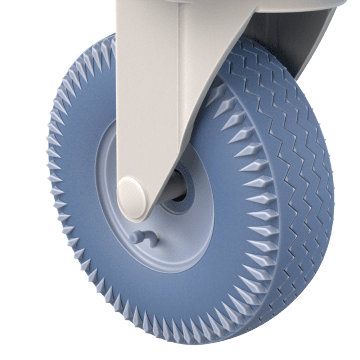 Get the cushioned ride of pneumatic wheels without the worry of a flat. Made of solid foam, flat-free wheels are perfect for demanding industrial and construction work areas with potentially sharp debris like nails and metal shavings, or in rocky environments. They weigh only slightly more than air-filled wheels. 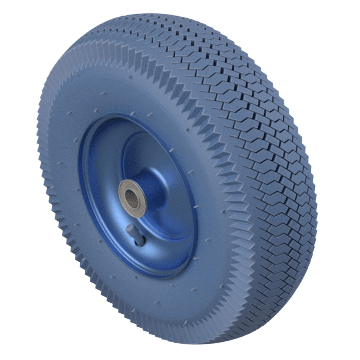 With a solid rubber body, these durable flat-free wheels can withstand rougher treatment and more demanding applications than flat-free foam wheels making them a good choice for both indoor and outdoor use. They also have better shock absorption than standard tread wheels. Frequently used on outdoor equipment such as hand trucks, lawn mowers, and wheelbarrows.